Irene White, center, with fellow school psychologists, from left, Emily Chaddock, Grace Jones, , Debby Nash, Luisa Mossa, Lila Samia and Bradley Rush. 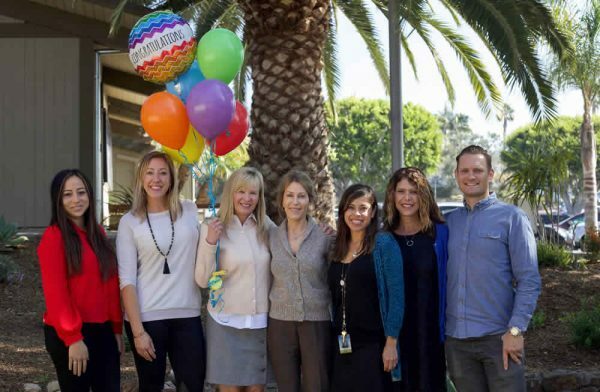 Irene White, director of special education for the Laguna Beach Unified School District, was named Special Education Administrator of the Year by the Association of California School Administrators Region 17, which covers Orange County. Administrators are selected by the organization for their outstanding performance and achievement in their respective categories. White was nominated by school psychologist, Luisa Mossa, and surprised when it was announced. Region-wide award recipients will be acknowledged by the administrators organization on May 7 in Irvine.